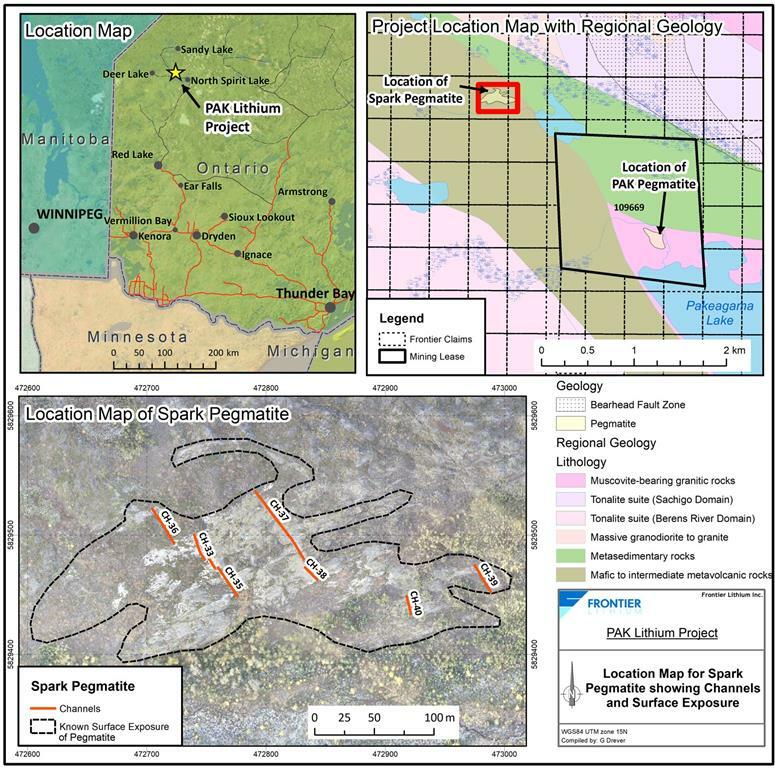 SUDBURY, ON / ACCESSWIRE / January 17, 2019 / Frontier Lithium Inc. (TSX-V: FL) (the "Company") is pleased to announce the results of surface channel sampling of the newly discovered Spark Pegmatite, 2.3 km northwest of the PAK deposit (Figure 1), located on the Electric Avenue, a newly emerging premium lithium-metal district hosted in the Canadian Shield of northwestern Ontario. See Frontier Lithium Press Release issued November 7, 2018 for additional information. Channel sampling was initiated at the time of discovery in September 2018 and completed a month later in October. The pegmatite is well exposed where minimal stripping by hand was required to complete the channel sampling. In total 236.4m of channels were cut and represent two main transects (Channels 33 to 35 for 64m and Channels 37 and 38 for 94.5m) that are 65m apart and 3 additional channels, CH-36, CH-39 and CH-40 cut where the pegmatite was exposed. Figure 2 is a view from the west showing the trace of the channels draped over the topography. The assay results and location for the channels are presented in Table I and Table II respectively. Channel 33 to 35 represents a continuous transect of 64m averaging 2.05% Li2O while Channel 37 to 38 located 70m to the east, is 94.5m averaging 1.85% Li2O with elevated Ta2O5 up to 615 ppm and 2.9% Li2O over 6.2m from 63.2 to 69.4m. Channel 36 (northern extension of Channel 33 to 35) averaged 2.02% Li2O over 35m. 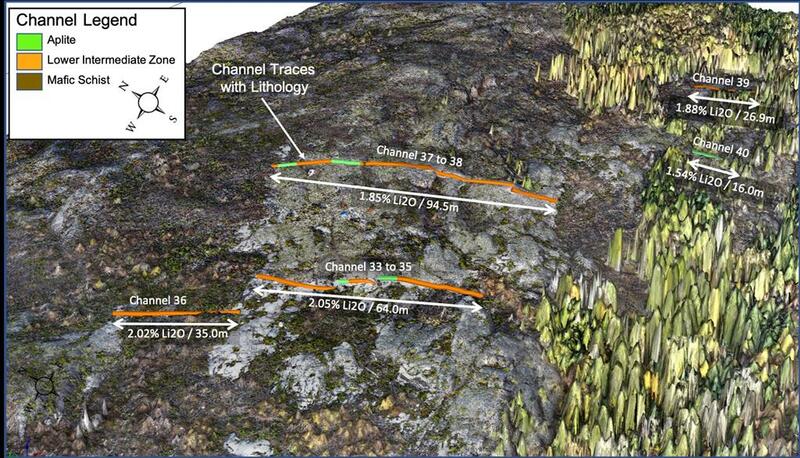 Channel 36 could not be continuously sampled; however, overburden was removed by hand exposing continuous pegmatite. Channels 39 and 40 to the east average 1.88% Li2O over 26.9m and 1.54% Li2O over 16m respectively. Sampling the surface exposures of the Spark Pegmatite shows consistent grades of Li2O throughout the sampled area varying from a low of 1.5% in Channel 40 in an aplite-rich pegmatite to over 2% throughout much of the rest of the pegmatite with narrower zones (<18m) ranging between 2.5% and 3.2%. High grade lithium zones of over 4% Li2O similar to the UIZ (Upper Intermediate Zone) at the PAK deposit occur, but over intervals typically less than 2m. "We are extremely pleased these results and excited about the addition to the PAK Lithium Project. The consistent lithium grade across the channels and the lithological homogeneity across the width of the exposed pegmatite suggests this pegmatite could be substantial. The showing is the focus of exploration as it appears that the potential for a resource to augment the PAK deposit is high," stated Trevor Walker, President and CEO of the Company. All scientific and technical information in this release has been reviewed and approved by Garth Drever, P.Geo., the qualified person (QP) under the definitions established by National Instrument 43-101. Under Frontier's QA/QC procedures, channels are cut with a motorized circular diamond saw, and are 4 cm wide and 10 cm deep. The channels are typically oriented perpendicular to the strike of the pegmatite internal mineralogical zones and are cut continuously across the zones. The samples are removed using a hammer and chisel. The length of a channel is determined by the width of the pegmatite zone. Offset channels are cut where deemed appropriate. Sample lengths typically are 1 metre but can be less depending on zone mineralogy and boundaries. Samples are described, placed into a poly sample bag with a numbered sample tag and then shipped to the assay lab for quantitative multi-element analysis. All samples were assayed by AGAT Laboratories Ltd. ("AGAT"), an ISO accredited laboratory in Mississauga, Ontario. Sample blanks along with tantalum, lithium, rubidium and cesium certified reference material was routinely inserted into the sample stream in accordance with industry recommended practices. Field duplicate samples were also taken in accordance with industry recommended practices. Frontier Lithium is a Canadian junior mining company and have the largest land position in the Electric Avenue, a newly emerging premium lithium-metal district hosted in the Canadian Shield of northwestern Ontario. Frontier is implementing a phased approach to development for becoming a producer of technical grade lithium concentrates required to produce premium glass/ceramics as well as supplying a by-product of chemical grade concentrates for the production of lithium hydroxide required for the burgeoning lithium battery industry. Frontier's goal is to become a low-cost, fully integrated lithium producer through development of the PAK lithium deposit in Ontario, Canada. Frontier maintains a tight share structure with management ownership exceeding 30% of the Company. The deposit boasts its lithium in a rare, high-purity, low-iron spodumene and is analogous to the Greenbushes' Deposit in SW Australia, which supplies approximately 40% of the world's lithium demands. Frontier has recently discovered a new LCT Pegmatite showing that called the Spark showing, which at surface has displayed a channel cut with similar grade and composition to PAK Lithium Deposit. The surface exposure is 3 times larger than the PAK pegmatite which widths greater than 100m and a strike length of more than 300m. Ceramic/glass customers prefer to source technical-grade (low-iron) spodumene concentrate in excess of 7% lithium oxide (Li2O), if available, to avoid inferior lower grade petalite concentrates, or paying much higher prices for battery grade lithium compounds. The PAK lithium deposit remains open in all directions and Company Management is working towards developing a viable operation. The Company has completed a pre-feasibility study to assess the economic viability and technical feasibility of producing lithium concentrates. The PAK Lithium Project lies close to the boundary between two geological sub-provinces of the western Superior geologic province in northwestern Ontario and hosts a rare metals pegmatite deposit. The deposit is an LCT (lithium- cesium- tantalum) type pegmatite. These types of pegmatites have been the principal source of hard rock lithium, tantalum, rubidium and cesium ores mined in the world but there are comparatively few commercially-viable deposits. Frontier is actively exploring its 100% owned project which contains the Pakeagama Lake pegmatite. The PAK deposit has a current Measured and Indicated Resource of 7.5 million tonnes of 2.02% Li2O and an Inferred Lithium Resource of 1.8 million tonnes of 2.10% Li2O which has a technical/ceramic grade spodumene with low inherent iron (below 0.1% Fe2O3) as per its NI 43-101 Technical Report, "Preliminary Feasibility Study" disseminated on April 16, 2018. The deposit now has a known 500m strike length with an estimated true width varying from 10m to 125m with a sub-vertical orientation. The resource remains open to depth and along strike to the northwest and southeast. 2736 Belisle Drive Val Caron, ON. Additional information regarding Frontier Lithium is available on SEDAR at www.sedar.com under the Company's profile and on its website at www.frontierlithium.com, including various pictures of ongoing work at the project.